Subject reports and articles covering a wide range of issues related both directly to the life and work Ogarev N.P. and with broader historical context of the XIX century. It is obvious organic connection of thoughts Nicholas Platonovich and considered in the collection of questions. In particular, it refers to the Decembrist uprising, the views of Alexander Herzen, understanding the role of the Russian intelligentsia and the values of freedom of speech for the country's progress. Therefore decided to arrange work without division into sections. 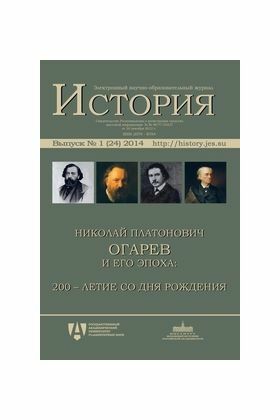 The authors and contributors of this issue of the Electronic scientific and educational journal "History" hope that their modest contribution to the study of the liberation movement in the framework of the project on the 200th anniversary of Alexander Herzen, NPOgareva and MA Bakunin, help to draw attention to the problems of this sector, to strengthen scientific research, and to find points of contact of the fundamental problems of the past and present. Ogarev: “Only on the full freedom of expression success for Russian development"